Traditionally, the Seven of Swords indicates theft, betrayal, deception and trickery. You may be trying to get away with something and are sneaking around behind other people’s backs, hoping to go undetected. If you are lucky, you might get away with your secret intact. But if you are unlucky, others will soon find out what you have done, causing you shame and embarrassment. Be aware that any time you use cunning or deception to gain an advantage over someone or something else, you are at risk of being found out. And even if you are not, the cover-up will require a tremendous amount of effort, and it may not be worth it. Alternatively, you may be the victim of someone else’s betrayal. Others are not being candid with you, and you may be unaware of their lies and deception. You may trust someone who then turns out to be running their own agenda, leaving you high and dry. Look out for any sneaky behaviour and listen to your intuition when something does not feel right or seems too good to be true. On a more positive note, the Seven of Swords points out that you need to be strategic in what you do. You know you cannot do everything at once – nor should you. Instead, you must prioritise what’s important to you and direct your focus and attention on the few tasks that will move you closer to your goals. It’s the 80-20 rule: 20% of your work will account for 80% of your results, so focus on the 20%. You may be able to accept some responsibilities or duties, but not all of them. Or you may say ‘yes’ to some projects at the expense of others. At times the Seven of Swords suggests that you may need to put yourself first to get what you want, even if it means letting others down or putting others off-side. For example, you may be asked to travel for work to attend a high-profile event, but it would mean missing your child’s birthday, so you decline the travel opportunity, even though you know it will upset your boss. Here’s the thing: you can’t be everything to everyone, and sometimes you need to put your own needs and priorities first, even if others may not agree with you or understand where you are coming from. The Seven of Swords could also imply that you are trying to escape from a situation that is not working for you anymore rather than dealing with it head-on. You may attempt to run away from commitment, responsibility, hard work or love. You may procrastinate, letting problems slip and become worse because you do not want to deal with them. Sometimes you just have to face what has to be faced. The Seven of Swords often appears reversed when you feel like a fraud and are suffering from ‘imposter syndrome’. You may doubt yourself and your abilities. For example, if you have started a new business, you may ask yourself, 'Who am I to be doing this?' Know that this is fear talking. Get out of your head and trust that you have everything you need to make your new venture a success. 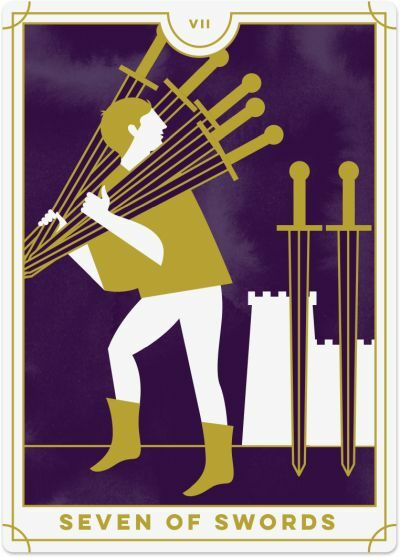 Similarly, the Seven of Swords reversed can suggest that you are deceiving yourself, trying to trick yourself into believing something even though it is out of integrity with your true self. You may attempt to fool yourself that everything is okay when it is not. Now is the time to get real with where you are and confront your situation head-on. As a card of inner deceit, the reversed Seven of Swords represents keeping secrets hidden from others. You may be harbouring a dark secret that you hope will never be revealed. Keeping this secret may bring you stress and tension, along with deeper feelings of guilt and shame. While the thought of confessing may be horrifying, it will free you from the negative emotions you are experiencing. First forgive yourself, then confide in someone you trust. You will no doubt feel much lighter as a result.